Derry Well Women is inviting applications for the post of Creche Co-Ordinator. The closing date for applications is Friday 2nd February at 12 noon. 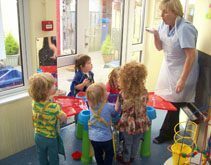 Registered with the Western Health and Social Care Trust, the Creche provides short time child care to mothers attending a broad range of programmes and courses including Counselling and Mother and Baby Programmes. Derry Well Women is a Health Centre for Women and Children. The post of crèche co-ordinator is for 30 hours per week on a 27 month contract, with a starting Salary of £17,210, plus Pension. · A Level 5 Diploma in Leadership for Children’s Care, Learning and Development. · 2 years Leadership experience including supervision of staff and volunteers in the last 5 years, working in an Early Years setting with children 0-5 years. · Paediatric First Aid Certificate – which must be current. · Health and Safety Certificate – which must be current. A wide range of structured and free play opportunities are provided. We provide a variety of equipment, materials and activities for different ages and stages along with multi cultural and diversity toys which enable the children to explore diversity. We provide a wide range of recycled materials to encourage heuristic play. Parents receive a small development booklet which shows in picture and story how each child has developed during their time in the Creche. We have a small garden where children can gain first hand experience of growing fruit, vegetables, herbs and flowers. Children are also able to enjoy outside play using natural materials. Our Creche promotes healthy eating for children, and we provide a variety of fruit options. Our Policies and Procedures are provided to parents in both hard copy and CD. All parents receive a Creche booklet which includes guidelines on child safety within the Creche.